AUTHORITY: Article 9, Supplementary Agreement to NATO SOFA; 10 USC 3012. 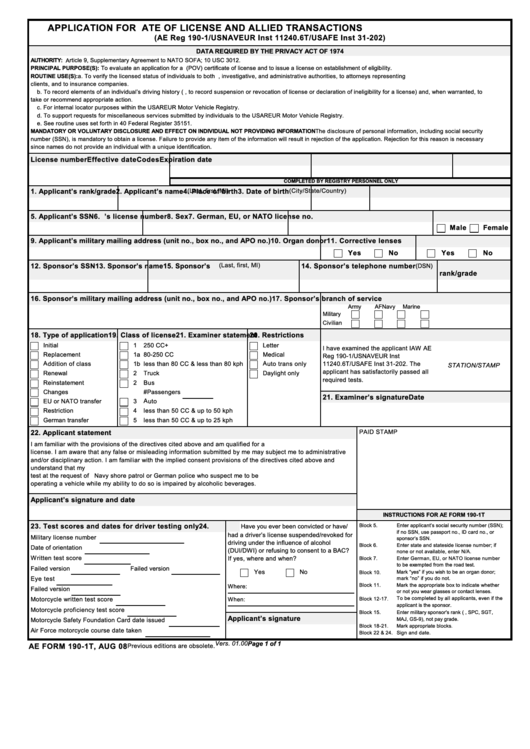 PRINCIPAL PURPOSE(S): To evaluate an application for a U.S. Forces privately owned vehicle (POV) certificate of license and to issue a license on establishment of eligibility. clients, and to insurance companies. take or recommend appropriate action. c. For internal locator purposes within the USAREUR Motor Vehicle Registry. d. To support requests for miscellaneous services submitted by individuals to the USAREUR Motor Vehicle Registry. e. See routine uses set forth in 40 Federal Register 35151.
since names do not provide an individual with a unique identification. 7. German, EU, or NATO license no. operating a vehicle while my ability to do so is impaired by alcoholic beverages. (DUI/DWI) or refusing to consent to a BAC? none or not available, enter N/A. to be exempted from the road test. mark “no” if you do not. or not you wear glasses or contact lenses. MAJ, GS-9), not pay grade.